The DALI/USB Bridge is a control and configuration device that connects a DALI bus with any computer equipped with a USB port. 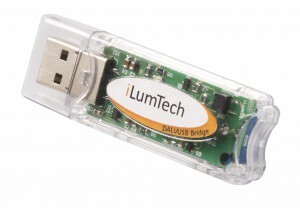 The DALI/USB Bridge allows for the setting of the operating parameters defined by the DALI standard and the operating parameters of iLumTech control devices. The small form factor and wiring simplicity of the DALI/USB Bridge makes it ideal for DALI bus setup and commissioning. DALI/USB Bridge is designed mainly for setup of DALI network and its commissioning. Firstly you have to install DALI Controller software available on our website. During the installation also the USB drivers will be installed. After successful installation of software you can connect the DALI/USB Bridge to your PC. When DALI network is correctly powered green LED is lit. Red LED indicator is flashing when DALI/USB Bridge transmits data while green LED indicator is flashing simultaneously indicating the activity on the DALI line. If only green LED indicator is flashing it indicates the communication initiated by other DALI devices. Detailed description of DALI Controller software is included in its user guide.